The Parliament of Republic of Macedonia started its 61 session, at which the Proposal for accession to the revision of the Constitution of Republic of Macedonia is on the agenda with directions for its amending and supplementing submitted by the Government. – Take a look into the future, into the future of your children, said the Prime Minister, adding that the will of the citizens is the state to move forward. 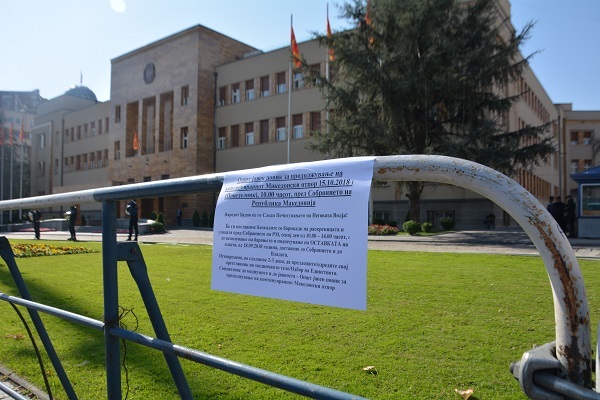 Ilija Dimovski from VMRO-DPMNE, before the voting on the agenda, requested for the item to be taken off because, as he said, this issue has neither electoral, nor referendum credibility. In regards to Dimovski’s proposal, 39 MPs voted in favor, while 67 were against. MPs of all parliamentary groups are in the hall, and the Minister of Foreign Affairs, Nikola Dimitrov, is also present at the session. Before the start of today’s parliamentary session at which the constitutional changes are being debated, CIVIL Media asked the MPs what their expectations are from today and the session. Some of them were willing to give a statement, while others just passed by the journalists without a comment. The protest of the Association of citizens “Prerodba” (Renaissance) in front of the Parliament of Republic of Macedonia has started, for, as they say, continuing the Macedonian resistance. Even though the protest and blockades were scheduled for 10.00 am, they started with an hour delay, and have a presence of about thirty citizens. In addition to the demands of the Association, which they expressed in front of the Parliament, they were also accompanied by folk music. “I heard the Prime Minister’s speech and understood it as an offer for amnesty. At first, defined as a position there is no amnesty for anyone. That is, we will lend a hand to everyone, but amnesty to no one. Secondly, in the words of the Prime Minister I heard a call for reconciliation. Our society is deeply polarized, that is, deeply divided. And as such, it is very difficult to build a consensus on any matter. However, this issue is so important that we have to build a consensus if we want a future for our country. If our society is polarized, the Parliament is even more polarized”, said Pavle Bogoevski, to a question of CIVIL Media in regards to the statement of Prime Minister Zaev and the message for reconciliation and forgiveness. The Agreement from Prespa is a significant and favorable agreement for Greece and the region, and it will receive the majority of the MPs in the Greek Parliament, said the Greek Shipping Minister, Fotis Kouvelis, in the interview for the first program of the Greek state radio. – My assessment, and I would also say conviction, is that the Agreement from Prespa, an exceptionally important and favorable agreement for Greece and the broader region, will pass. My assessment is that the number of MPs in the Greek Parliament who will vote for the Agreement from Prespa, certainly if the processes in FYROM conclude, as it has been anticipated in the agreement itself, is that the majority will be provided also from MPs who do not belong to SYRIZA”, said Kouvelis.